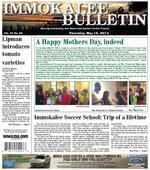 8 Immokalee Bulletin May 15, 2014 Seminole Casino Immokalee hosted a charity event on Thursday, May 1, to bene t the PACE Center for Girls' fourth annual "Love That Dress!" shopping spree event. The casino collected 181 new and slightly used dresses during the event. More than 145 Player's Club Members and sponsors of the PACE Center for Girls in Collier County attended and generously donated cocktail dresses for the center's premier event. Event-goers enjoyed complimentary cocktails and appetizers at the casino's popular Zig Zag Lounge. Those who donated a dress also received a coupon for $50 in free slot machine play. The fourth annual "Love That Dress!" shopping spree event will be held August 23 at the Naples Beach Hotel & Golf Club, w here guests may enjoy cocktails, a silent auction and choose from thousands of new and gently used dresses and accessories available for purchase at low prices. Proceeds from the event directly bene t the PACE Center for Girls in Collier County. About Seminole Casino Immokalee Open 24/7, 365 days a year, Seminole Casino Immokalee is Southwest Florida's premier gaming destination, with 1,200 slots, including Tarzan, Price is Right and the Big W heel. The 75,000-square-foot plus casino offers 34 live tables games, including Blackjack, Mini-Baccarat, Pai Gow, Let It Ride, Three Card Poker, Texas Hold em Bonus Poker, Blackjack Switch and Spanish 21. Seminole Casino Immokalee participates in the Seminole Players Club Wild Card Rewards Program whereby players earn and redeem points at all Seminole Casinos in Florida. Dining options include 1st Street Deli, Southwest Florida's only authentic Ne w York-style delicatessen. This award-winning restaurant is open 24 hours. The EE-TOLEET-KE ("The Camp") Grill serves up its signature authentic Seminole fry bread and made-from-scratch favorites. The Zig Zag lounge, home of the Zig Zag Girlz, is "where the party never ends" with nightly live entertainment and no last call. TVs throughout the Zig Zag bar air sporting events and other entertainment. A 10,000-square-foot Event Pavilion seating up to 800 guests is for large entertainment events, such as concerts, weddings, banquets, company outings and privately-held dances. The casino has 1,800 parking spaces. Located at 506 South 1 Street in Immokalee, Seminole Casino Immokalee is easily accessible to all of Southwest Florid a via I-75 and Southwest Florida International Airport is only a 45-minute drive from the casino. Located between Miami and Naples, north of Alligator Alley on Highway 846, it's ve blocks south of Highway 29. Approximately 30 minutes from Naples and Fort Myers, the casino is a 90-minute drive from Miami and Fort Lauderdale. For more information, call toll-free (800) 218-0007 or visit www.seminoleimmokaleecasino.com or www.facebook.com/seminoleimmokalee. 181 dresses collected during Pace Center event Submitted photoAttending the charity were, from left: Summer Raygor, Director of the Players Club at Seminole Casino Immokalee, Nan Mooney, Player Development Executive at Seminole Casino Immokalee, Marianne Kearns, Executive Director of the PACE Center for Girls Collier, Cheryl McDonnell, Development Director of the PACE Center for Girls Collier and Patti Gens, Counselor II of the PACE Center for Girls.